become our New PGA head professional. The even better news is, therefore, that David will take up his duties on Tuesday, February 12, in which case the period during which we need to make interim arrangements, will be of very limited duration. By way of background, David is an Aberdonian by birth and played off scratch before turning professional and beginning his career in golf in 2003 by being appointed an Assistant Professional at Oldmeldrum. 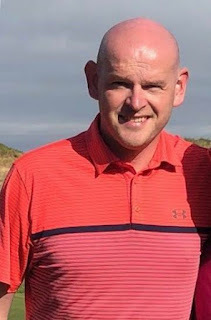 He progressed by becoming one of the teaching professionals at Pine Lodge Golf Centre at Kemnay for a couple of years and then became Head PGA Professional / Director of Golf at Kingscliff Golf Solutions, a corporate golf company based in Aberdeen until 2010. Pocock then headed south to Wales where he was head PGA professional at Rhondda Golf Club until 2012 and then became a co-founder and director of Golf of Valleys Golf Enterprise which was the first Golf Social Enterprise in the UK, delivering golf sessions to over 25,000 school children as well as adults in some of the most deprived areas in the country. David was so successful in this role, in 2014 he was head hunted by his current employers, Bryn Meadows Golf Hotel and Spa, which is the second largest independently-owned golf resort venue in Wales. He was Head of Golf Operations there and was also heavily involved in Sales and Marketing including Social Media responsibility. Pocock has also been involved in writing successful grant applications to assist the establishment of a 9-hole academy course and simulator studio in addition to instigating and growing the largest junior academy and junior section in Wales with over 200 children and beginner adults in membership and coaching weekly. During the interview process I was very impressed with David’s personality and generally relaxed approach while demonstrating a depth of knowledge of all aspects of a Golf Club operation. Indeed, I am genuinely excited at the prospect of what David can bring to Portlethen Golf Club. There is little doubt that Stuart Wilson will be a hard act to follow, but I do think in this appointment, members will again benefit from the services that can be offered by a PGA professional in addition to which, we have a great opportunity to ensure the club continues to progress and jump even further up the league table of clubs where someone would wish to be a member. Please, therefore, do make sure you introduce yourself to David as soon as you can after he arrives and make him feel welcome and part of the club as soon as possible. Finally, I would remind you again that you all have the opportunity to join with us at an informal function to say farewell to Stuart Wilson on Wednesday, January 30 from 7pm onwards. Stovies will be on offer to all those attending. As I have already said in my earlier message, it would be great if as many Members as possible can manage along and, just to aid planning, please remember to drop Dino or myself a note to intimate that you are going to be there.